You will see it all on this fun, exciting and educational all access tour of San Diego's historic Gaslamp Quarter and Harbor. You will see it all on this fun, exciting and educational all access tour of San Diego's historic Gaslamp Quarter and Harbor. Cruise by Victorian-era buildings while you are provided with local fun facts from your expert and energetic guide. 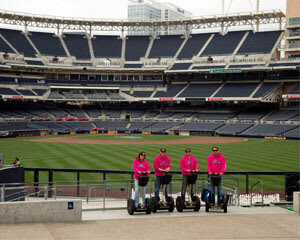 You will actually segway through the "Park at the Park" at Petco Park, home of the San Diego Padres. Other highlights include the state of the art San Diego Central Library, The San Diego Convention Center and Seaport Village. Be sure to bring your camera, when you cruise by Tuna Pier and the USS Midway you will be absolutely amazed at the size. Fun facts about the history of the Jewel City! Tours fill up fast so book yours today! Must weigh between 95 lbs. and 280 lbs.